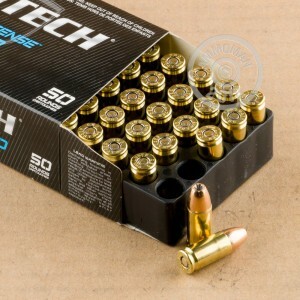 This 1,000 round case of 9mm Luger ammo from Magtech delivers cost-effective performance for all your target shooting and defensive needs. These cartridges fire a 124 grain bonded core jacketed hollow point bullet at a muzzle velocity of 1,165 feet per second. The bonding process greatly reduces the risk of core-jacket separation, a notorious cause of failure in hollow point ammunition. This is a standard pressure, full power load that will produce average recoil for the 9mm Parabellum. 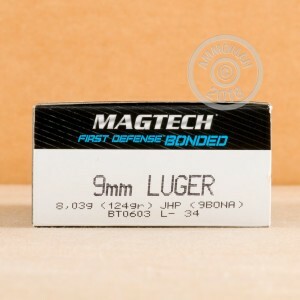 Magtech ammunition is loaded in Brazil by defense contractor CBC and uses non-corrosive Boxer primers and brass cases. CBC produces its own components to ensure better quality control. Buy this case or any other items with a total price of $99 or more and get free shipping from AmmoMan.com!